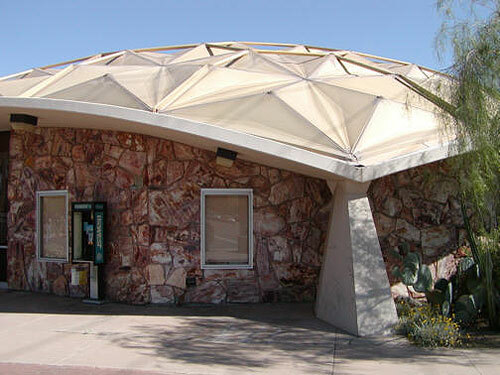 This geodesic dome dates from 1962 and the credited architects are Weaver and Drover. This is a panel dome. As a matter of fact, the roof is exactly the same low-slung aluminum panel structure that appears in a photograph in Buckminster Fuller's "Ideas and Integrities" captioned 'Kaiser dome over a Lutheran church in Florida'. Kaiser like Kaiser Aluminum, like Kaiser Permanente, like Kaiser Liberty Ships, as in Kaiser-Frazer, all attributable to the American industrialist Henry J. Kaiser, who licensed the geodesic dome from Buckminster Fuller. Kaiser mass-produced panel domes out of his Oakland, California aluminum works. The first dome went up in Kaiser's Hawaiian Village development in Waikiki in 1957 within a matter of 22 hours. Kaiser flew out for the construction but it was already finished by the time he arrived. It's 145 feet in diameter. Martin Denny started his bird-call-lounge-music career at the Hawaiian Village and recorded his first big album, "Exotica", in the dome to take advantage of the echo. By the end of 1958 Kaiser had completed eight large pre-fab panel domes, one of which is the Casa Manana in Fort Worth (weirdly right across the street from Louis Kahn's Kimball Museum), one of which is the recently renovated Gold Dome in Oklahoma City, and one of which is a former bank in Tempe Arizona. And one of which, I guess, was a Lutheran church in Florida. 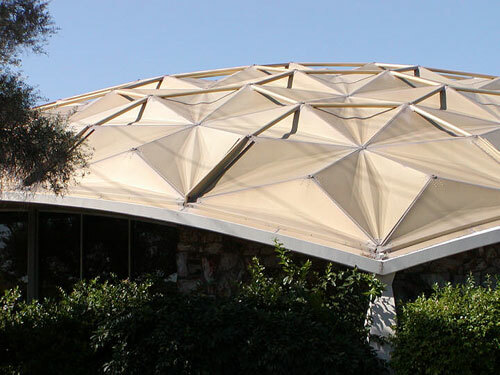 In a recent interview, Frank Henry (who worked for Weaver and Drover) said he worked on this building briefly, that the original configuration included space that the bank rented out, and the idea of using the geodesic dome came from Valley National Bank. Not only because it was stylish and futuristic and cool, but because it was an efficient means to build a branch bank, create a free-span space inside and a distinctive profile outside, visible from the street. The most amusing problem are the "Cards of Death". The 1962 press release quoted below suggested (to me) a dazzling mobile of diffused light in the curved interior cavity of the dome. The reality is less glamorous. 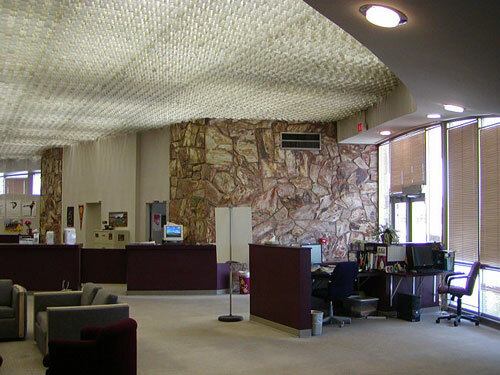 The ceiling is flat, and is hung with 23,400 cards at right angles to each other. They look exactly like employee badges. They're metal. They do indeed reflect / refract / diffuse the flourescent lights above them, but they.... fall down unpredictably and make people jumpy. And to change those flourescent bulbs is quite an operation. Then again, the thing is 40 years old. If you don't have any problems by the time you're forty, then, you're.... probably grooming yourself for public office. 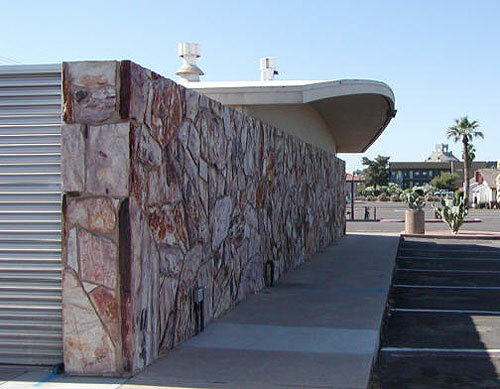 Along with the other five former Valley National Bank branch buildings on this website, this building has impeccable historic credentials relative to the VNB, Walter Bimson, and his role in Phoenix history. If its association with Bimson is not enough, it's also an engineering landmark. 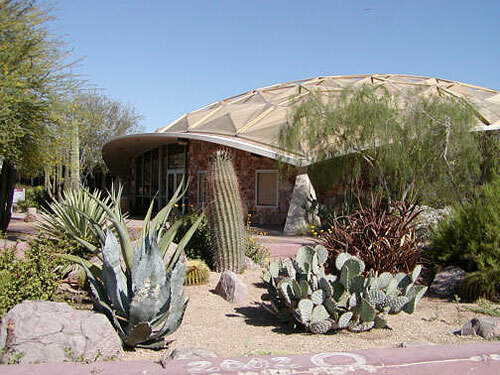 The building is one of a decreasing number of original geodesic domes in the United States. These last domes stand as the tangible legacy of Buckminster Fuller, Mr. Fuller always associated with a lot of dreamers and kooks, and ridiculed at length by the AIA and mainstream academics, occasionally with some justification. But the geodesic dome was, and is, a completely revolutionary construction technique and a legitimate advance of western civilization. No kidding. The underlying principle, "tensegrity", has been adopted for an increasing number of buildings through the 1980s and 1990s as the engineering profession catches up to Fuller, notably the roof of the Burton Barr library, but is still not fully understood or exploited. This isn't the past you're looking at, it's the future. When the Gold Dome in Oklahoma City of similar vintage was threatened with destruction by Bank One in 2002, there was quite a stir, and it made the National Trust for Historic Preservation 11-Most-Endangered List. That dome has been saved by a local orthodondist named Dr. Irene Lam, working with Bank One, who turned out to be sympathetic to the cause. "The golden dome on the Valley National Bank's new Tempe Office rises three-quarters of an inch during heat of the day, contracting again in the cooling night hours. Luminous ceiling above the 2600 square foot lobby is hung with thousands of wafer-thin aluminum leaves - each turned to a precise angle. Special lighting protection for the metal-roof structure was included in specifications by architects Weaver & Drover. These are among intriguing facts about Valley Bank's new building disclosed by manager James G. Gardner, as he checked last-minute details for the bank's open house this weekend." "...Despite its graceful, light appearance, Valley Bank's dome weighs several tons and possesses impressive structural strength. In tests, geodesic designs have supported more than 100 pounds per square foot and withstood hurricane winds of 125 miles per hour. In erecting the dome, more than 100 pre-shaped panels were fastened together with special bolts in a series of ever-widening circles around a central tower. The roof was lifted slightly as each new ring of panels was added. When the entire dome was assembled, it was lowered into place onto permanent supports and the tower removed. A critical factor in the dome's erection was accuracy in planning and placing the bearing points, which hold full weight of the 90-foot span. These and concrete arches between were cast in place with custom-built forms." "...Self-supporting feature of geodesic construction eliminated need for support columns or weight-bearing walls inside the bank. All walls in the building are curtain walls - except for the vault, which is virtually a separate building in itself. Constructed blockhouse fashion, the vault has 12-inch thick reinforced concrete walls, floor and ceiling. Between support piers, eyebrow-shaped arches curve to a height of 13 feet. Spaces here are enclosed with native stone, porcelain and quarter-inch thick glare-reducing glass. The "leaf light" ceiling creates an ever-changing aspect of color, texture and pattern when traversed by the eye. 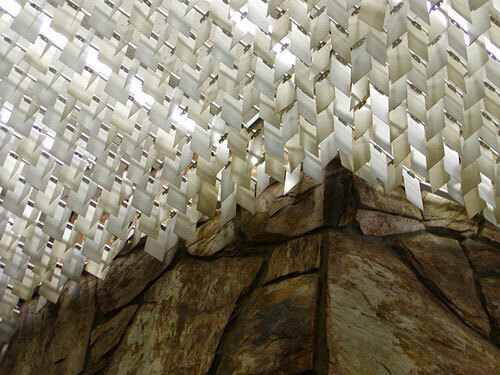 It consists of 23,400 aluminum leaves, alternating gold and white, each set at right angles to its neighbor. The vertically-hung leaves filter light from a source above." "Valley residents will have a preview of Arizona's first banking-by-television installation during the next few weeks at the Valley National Bank in Tempe. The bank is beginning construction work to install two television drive-in windows, and while this is underway the specially-made units will be displayed in the bank lobby, beginning Friday. Both will be operational - with the TV cameras and viewing screens working. 'Visitors will be able to see what television banking will be like - and at the same time see themselves on television,' VNB manager Jim Gardner said." 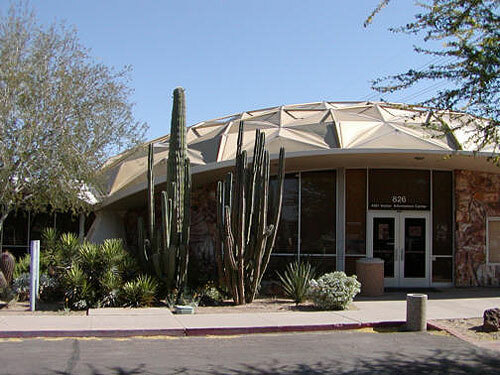 The ASU information center has been asked to be ready to move out by the end of June 2006, but the move itself may not take place until a couple of months afterward. There's a "growing movement" to save the building. The pleasant woman at the desk, for one, has mixed feelings about the move, with a certain affection for the building but direct experience with the building's shortcomings and problems. Let's say that again: as of June 2006, Arizona State University has not made its intentions clear, but have ordered the current occupants to be ready to move out. They're considering tearing this building down. According to the pleasant woman at the desk, if ASU does retain the building it'll need work in four or five areas. The main part of the roof has sprouted leaks and been patched many times. The chillers don't work properly so there are always temperature and humidity problems as the weather changes. Evidently the vault/conduit between the bank and the little outbuilding (former drive-through) also has an underground leak, which is a potential problem for the surrounding construction. The existing electrical system so overtaxed that you have to be careful what you plug in. On the bright side the building IS standing up straight and does NOT have suspicious odors, so there's the good news. The future of this building is uncertain as Arizona State University moves to make plans for expansion of the campus onto this valuable hunk of real estate. 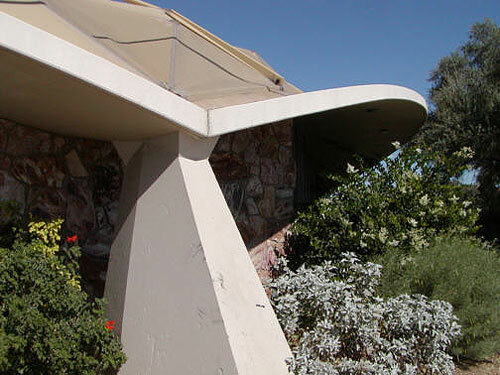 Because ASU has made no direct commitment or statement that ensures the building's future preservation, the AZ Preservation Foundation and the Modern Phoenix Neighborhood Network consider this building to be of Threatened Status. UPDATE: On July 12 of 2006, an ASU Press Agent issued the statement to ModernPhoenix: "The university is exploring options for the development of a new residential facility for the Barrett Honors College, but no decision has been made about the disposition of the VNB building." UPDATE: On February 10 of 2007, construction crews removed the dome and began to excavate the building. Send a message to ASU President Michael Crow: http://www.asu.edu/president/contact/ You may put "Member, ModernPhoenix.net" as the organization if you are not already affiliated with a relevant organization. I read about the uncertain future of the former Valley National Bank Building on Apache Boulevard in a June 2006 cover story on the Modern Phoenix Neighborhood Network at http://www.modernphoenix.net/vnb.htm. I am concerned that this building will not officially be eligible for historic status until the year 2012. That date cannot come soon enough. What can be done to ensure that this building is not altered or worse, demolished? It seems that developers in Phoenix are all too eager to destroy fine midcentury modern buildings such as these without truly assessing what value they have to the larger community and our civic architectural history. Let ASU set the standard among developers and within the preservation community by creating an active program of preservation for this site. _________, _________, and __________ . The press release materials presented here are reproduced as Fair Use for Journalistic Reporting.